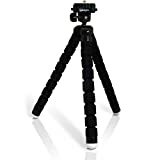 iGadgitz large mini tripod with 1/4 inch screw thread with quick release plate for Digital Compact Cameras. Rubber feet for stable positioning. Compact, lightweight and folds up for easy storage. This entry was posted in Discount Photography and tagged Black, Flexible, Foam, Fujifilm, iGadgitz, Large, Lightweight, Mini, Plate, Quick, Release, Tripod, Universal, XPro1, XT10 by Ball Photo. Bookmark the permalink.